In India, laddoos come in many varieties.Peanut ladoo is a tasty snack which is prepared under 10 minutes. When we were kids, it would be finished in a single day if my mom prepared it. Also can be used on a day one is fasting. 1. Dry-roast peanuts in a large pan until they turn golden brown. The raw smell shouldn't be there. Otherwise it doesn't taste good . 3. In a blender, grind the nuts for just 5 seconds. 4. Take in a bowl mix the powdered sugar. 5. 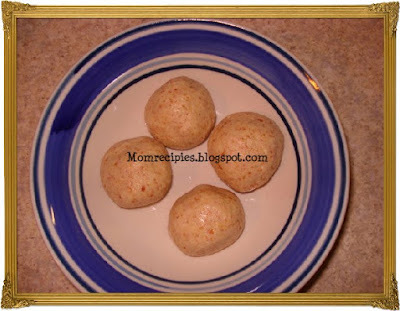 Add enough ghee to make round laddoos. 6. Mix well and make small-sized firm balls. Its quick and easy to make and serve. Wow! Peanut laddus! Slurp! It's gobbleworthy! oops yummy one.I love this.so easy to make . will make it soon. They looks so nicely shaped and yumm. I was planning to try peanut laddoos, u have posted it..Ladoos looks gorgeous..
i have had this and love it..now time to try it soon..
peanut ladoos mmmmmm mouthwatering nice recipe sireesha. cool.. I am bookmarking this one now..